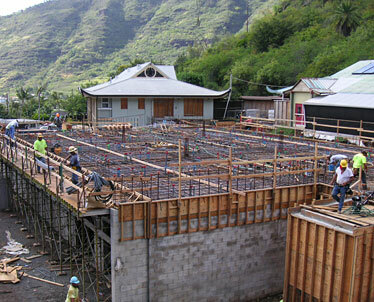 Construction is under way at the Palolo Chinese Home to expand the property and allow for the care of more seniors. Palolo Chinese Home is one of the oldest care homes in the U.S. founded by an Asian community. Its history dates to 1896, when a group of 327 Chinese residents led a drive to establish the Wai Wah Yee Yin Hospital to care for immigrant men of all ethnicities who could no longer work on the plantations. As the hospital became overcrowded, the founders -- the Chinese Men's Committee of the Associated Charities of Hawaii, a predecessor of Aloha United Way -- purchased 15 acres in Palolo Valley to establish the Palolo Chinese Home. To continue its mission, a benefit will be held Friday at the Hilton Hawaiian Village. Two founders of the home, Chung Kun Ai and Doo Wai Sing, will be honored, along with volunteers Gilbert S.N. Hong and H.Q. Pang. The home is expanding to meet growing elder-care needs among lower-middle- and middle-income seniors. Renovations and an increase in beds should allow the home to serve more than 400 needy seniors. In 2006 one of the buildings in the complex was renovated to accommodate the community outreach program HiNOA, a day-care center, a nursing wing and the Hospice House. Patricia Laurel, staff physician for the Department of Geriatrics at the University of Hawaii, makes house calls through the outreach program. "If patients are homebound or have complicated medical problems, the visits make things easier for them," she said. "It gives them the support that they need." Insurance covers the visits for eligible seniors, many of whom have complicated medical problems or are homebound, making it hard for them to get to clinics for regular doctor visits. The outreach program allows seniors to remain in their own homes and neighborhoods, Laurel added. "It's like a bridge that helps the family keep a loved one home as long as possible before having to make a transition to a nursing home," she said. "We are trying to make their lives a little easier and keep them healthier."